An interesting mystery disc discovered. I stumbled across an interesting post over at Arcane Radio Trivia where the author discovered an old Home Recording Acetate, in bad shape, but still intact enough to recover some information. From around or before 1940, these “phonograms” were used to record programs from the radio or from an attached microphone at home. This one had a flimsy paper core which apparently didn’t hold up well to the test of time, but Arcane Radio Trivia managed to grab 1:57 of audio from it. Click through to that site to listen! 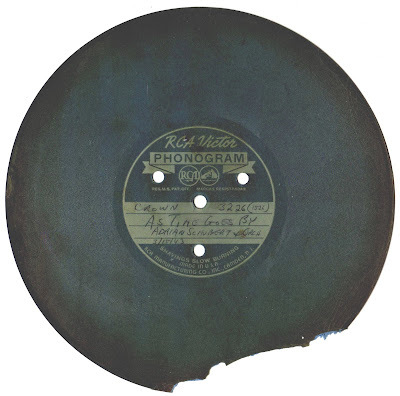 This entry was posted in Commentary, Radios and Tubes, Vintage and tagged 78 rpm, arcane radio trivia, audio, home recording acetate, phonogram, phonograph, radio, rca victor, record, record player, recording. Bookmark the permalink. 1 Response to An interesting mystery disc discovered.